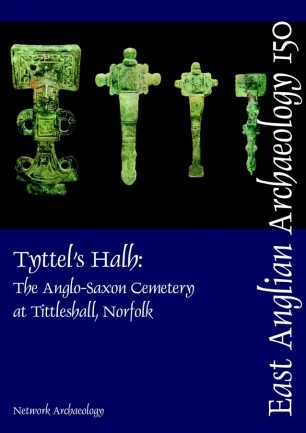 Tittleshall lies west of the Launditch earthwork, on a long-term north-south boundary, in west-central Norfolk. A small group of Anglo-Saxon inhumation and cremation burials was excavated there by Network Archaeology, to the south of the modern village, on the edge of a Bronze Age barrow. The 28 individuals buried there during the 5th to the 7th century included men, women and children who are thought to be the dead from a single farmstead. Three children’s burials were of particular interest. They included a young boy wearing some of the finest linen in the county, with a sword scabbard and the remains of two knives at his waist; a girl buried with a hybrid brooch amalgamating elements from communities to the east and west of Tittleshall; and a six- or seven-year-old dressed in the clothing of an adult, but with the sharp brooch-pins taken out and replaced with leather thongs. Among the adults were a woman wearing an ornate gilt brooch that clasped a cloak made of the Anglo-Saxon equivalent of cashmere, with a fur trim or cape; and a man of mature years laid to rest with his head on a shield of his father’s or grandfather’s generation. The material has been placed in the context of the changing social and political landscape of East Anglia over the period in question. The report includes Correspondence Analysis of women’s burials on the Wensum-Yare-Waveney river system; a review of place-names in relation to local landholding patterns; and fresh evidence for the north-south territorial boundary.